President Petro Poroshenko of Ukraine has said martial law will be introduced in the entire territory of Ukraine starting from 9 a.m. on Wednesday, November 28. 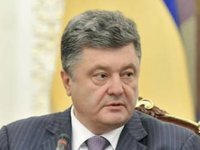 "According to the NSDC's decision… as the president and the commander-in-chief of the Ukrainian Armed Forces, I have performed my constitutional duty and issued a decree a few hours ago to introduce martial law in the entire territory of Ukraine starting from 9 a.m. on November 28," he said in a televised address to the nation on November 26. The president stressed that his decree does not provide for any measures leading to any restrictions of citizens' rights and freedoms or introduction of censorship. "I hope politicians and the media will act responsibly and appropriately under the current circumstances and will not attack Ukraine with the theses borrowed from Russian propagandists," he said. Poroshenko said his decree only includes those options that mostly relate to military measures, such as human, military, and financial resources, which, in case of the aggressor's invasion, will allow Ukraine to mobilize all of its resources quickly. He said he is not going to make use of full or limited mobilization; however, he said that such a possibility will continue to be open only if the Russian Federation decides to further escalate the situation. "Martial law does not mean the declaration of war. It is introduced only to strengthen the defenses of Ukraine in view of the growing aggression from Russia. Martial law does not mean any refusal to discontinue the settlement of the situation in the east by political and diplomatic means. I have informed our Western partners about it today," the head of state said. "Early in the morning today I held talks with NATO Secretary General Jens Stoltenberg and Poland's President Andrzej Duda. Poland is now representing Ukraine's stance and it has done arrangements for this issue to be considered by the UN Security Council. I have also held talks with Germany's Counsellor Angela Merkel and many others. The consultations will continue tonight," Poroshenko said. The Ukrainian head of state said Ukraine's Western partners have started paying much more attention to the situation in the east of Ukraine in general and in the Sea of Azov in particular. "Today we are being heard much better than yesterday and the day before yesterday," he said.